In the spirit of trying to help my colleagues sell some books during this gift giving season, I am giving recommendations for books that you can either buy at a bookstore or order online. If you would like to support your local independent bookstore, but need help finding one check out this website or you can follow links from the author's websites and blogs to online retailers. To help give some visual appeal, I'm including images of their cover art. My friend Erika Mailman's first major novel was published in September by Random House. Erika's website is here and her blog can be found here. Jordan Rosenfeld has a book that has just been published by Writers Digest and she will be a return guest speaker at my writers club next weekend. At that time I shall buy a signed copy of the book and be able to provide an informed review. Until that time, know that I have respect for Jordan's professionalism and have every confidence that her book will be filled with wonderful insight into the creative process. Here are links to her website and blog. Lee Lofland's first book was also a Writers Digest book that was published in August. 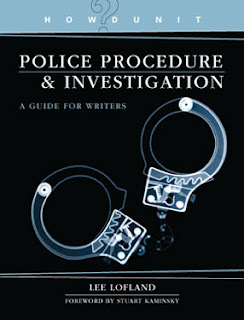 This is a great reference book for writers who wish to understand police procedures. It is more than that though. Lee explains how the hierarchy of law enforcement is structured between local police departments, sheriffs departments, the state police, the FBI, the ATF, the U.S. Marshals and more. He also gives examples of terminology we all have heard and thought we understood. Such as the difference between a crime scene and the scene of a crime. They are different. Or the difference between homicide, murder, and manslaughter. No they are not synonyms. Yes, this book would make a fabulous gift for writers in your life that even want to barely touch on crime as an aspect in their work to help avoid making cringe-worthy mistakes, but it would also make a great gift for anyone who is interested in going into law enforcement. It would be an excellent reference book for someone trying to understand all the new lingo and terminology involved in that profession. I have to think it would be better written than a lot of dry as sawdust textbooks on the subject. Lee has a great sense of humor and it comes through on the page. This is a great book even if you aren't interested in writing about crime or going into law enforcement, for it will help you to understand the occupational complexities of those who are sworn to protect and defend us. Lee's website can be found here. He has several articles posted on his website, but unfortunately Lee does not maintain a blog. Occasionally he will do a guest spot on a blog, but he has not started to do it on his own yet. 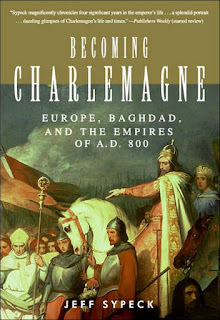 Jeff Sypeck's wonderful book Becoming Charlemagne will be coming out in paperback just before the Christmas holiday. I would recommend either buying the hardcover version or pre-ordering the paperback with the hopes it will arrive in time to your intended recipient. I've read many books on the Medieval period and Charlemagne in the last two years. This is now one of my favorites. Jeff Sypeck put the events of the period in a context which allows the reader to understand the various political forces competing against one another during that era, and the skill used by King Charles which ultimately led to him being referred to as King Charles the Great or Charlemagne. I had read mentions of Empress Irene of the Byzantine Empire before, but her villainy and treachery never really impressed me until reading Sypeck's version. This time it took on the magnitude worthy of Shakespearean tragedies. The lives of Jews during the time of Charlemagne is a topic I had not seen mentioned at any length in the other various books I read, and Sypeck devoted a chapter to discussing how their treatment which by and large are hidden in the historical record. Charlemagne did not persecute Jews as he did those in his realm who worshiped pagan idols. Many Jews were educated, well-traveled, merchants, and officials in the royal courts. One Jew was sent by Charlemagne as an ambassador to Baghdad to speak with the leader of the Muslim empire, Harun al-Rashid. It is the various acts of political gifts from one leader to another (Harun to Charlemagne) which were then perceived as a political slight by other leaders (Empress Irene) that I found most fascinating. And then there is the dramatic saga of Pope Leo III and his attempted assassination that underscores the dramatic story of Charlemagne's coronation as Emperor. This isn't dry history with a simple recitation of facts, it is a story of intrigue brought to life. You know that Shakespeare had to base his stories on something. Jeff's website is here and his blog can be found here. He was fortunate enough to have a booksigning recorded and broadcast on C-SPAN 2's Book TV. You can watch that online here. Ari Siletz's collection of short stories is now back in print. With all the saber rattling and demonization by members of the Bush administration against Iran, I think it is more important than ever that people read his book. 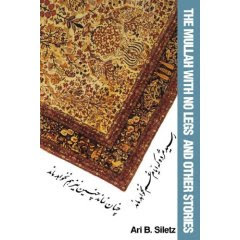 Through gentle humor, Siletz shows the differences and similarities between Iranian and American culture. Siletz has a graceful manner in telling stories that leads the reader into territory that feels unfamiliar at the outset, but brings understanding of the commonality of the human condition by the end. His stories have an autobiographical feel to them, but they are fiction. They are based on his childhood experiences in Iran and are written with an eye towards enlightening American audiences about life in Iran. One of my favorite stories was "The Dog" for it showed the cultural differences in how dogs are perceived between Iranians and Americans. The funniest aspect was showing how his Iranian family was surprised to hear that anyone could make money selling dog food, dog toys and dog soaps. Because dogs, while not forbidden are considered to be unclean. A favorite line of mine was "Give a parched Iranian the choice between a glass of water sniffed by a dog and a glass of radioactive waste, and he will have to think about it." Ari's website and blog can be found here. 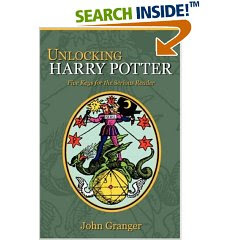 John Granger has been one of the foremost champions of recognizing the importance of literary alchemy in the Harry Potter series. This is his fourth book examining and analyzing evidence from the wildly popular series. Many people simply scratch their heads and say, "Alchemy? That weird pseudo-science that predated chemistry? The one where nuts tried to turn lead into gold?" Yup, that's the one. Except John Granger goes on to explain exactly what alchemy was and wasn't, and why our perceptions of the secretive practice are skewed. He also convincingly argues that literary alchemy is a long-term practice by notable authors such as Shakespeare, Milton, Blake, C.S. Lewis and James Joyce. Then he gives example after example of the evidence of alchemy in the Harry Potter books. Examples which cannot be simply coincidence. Bingo. In one fell swoop, John has been proven correct in his analysis that Jo Rowling uses literary alchemy in structuring her series. Other ways to tell alchemy plays a large role in the Harry Potter books is by looking at the illustration he chose for the cover of this book. Do you see the Golden Snitch? Buy his books, read them over, and then read the Harry Potter books again. You will then recognize that there are layers of meaning and structure beneath the text. John's blog is here and the website for Zossima Press is here. 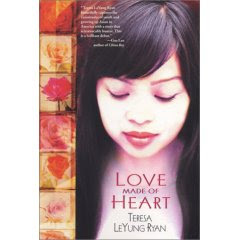 Teresa LeYung Ryan wrote a beautiful novel that is still available. Love Made of Heart is a wonderful book filled with emotion and drama from page 1. I want to vicariously experience the lives of the characters while turning the pages. I want to laugh, to cry, to feel fully human and alive. I want dramatic conflict. I want to read things that I would find terribly uncomfortable in real life. Conflict is drama. This book has all of that, and it is done with grace and a deft touch. Anyone who has a mother should be able to recognize the various guilt trips that Ruby Lin's mother tries to repeatedly foist off on her. It rings true. I look forward to reading LeYung Ryan's next book. Teresa's website can be found here. My father wrote his autobiography several years ago and it is an insightful book regarding dyslexia. He is an amazing teacher. I have seen him sit down and work his magic with people who had given up on themselves and thought that they could never learn to read. It is simply amazing and if you would like to see him in action you can that here. Within a few minutes, he is able to get a student who thinks he cannot read into correctly reading the word "malicious." 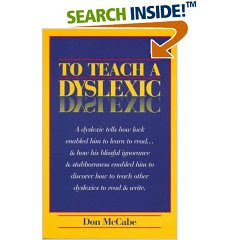 Don McCabe writes a compelling autobiography to illustrate what it is like to grow up dyslexic. He was born in 1932 and this was well before "dyslexia" was a term, let alone a diagnosis. He was just treated as a boy who couldn't sit still. He credits his older sister and wonderful teachers who worked intensively with him to help him learn to read and eventually to become a respected scholar. McCabe has dedicated the last thirty years to working on literacy. This book is a quick, fun read that shows a good dose of humor helps in discussing serious topics such as dyslexia. If you or someone you love has been diagnosed as dyslexic, don't wring your hands in despair - buy this book and learn from someone who knows first hand about what it means to be a dyslexic. My father's website which contains a wealth of information on literacy can be found here. If you would like lighter fare, how about a joke book or two? My friend Rob Loughran has collected and perfected jokes over the last thirty odd years as a waiter. You can get them in small themed books or in one huge compendium. You can buy Rob's joke books here. Lastly, there is the latest anthology my writers club has released. 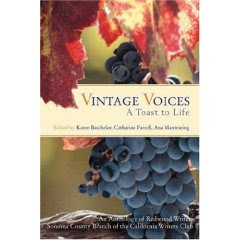 It includes submissions by twenty-six members of the Redwood Writers branch of the California Writers Club including Rob Loughran and myself. I am partial and think it is a lovely book. Here's hoping that my recommendations will help people in their quest to find a great gift for a friend or loved one or to supplement one's own bookshelf. Linda, thanks for the recommendation! I'm so glad you enjoyed Becoming Charlemagne enough to recommend it. Die-hard Charlemagne buffs should know that signed hardcover copies are still available. Anyone who's interested just needs to contact me at the e-mail address on my blog. It was my pleasure. I heard a mention this morning on the radio news that tomorrow is considered to be "Cyber Monday" when most online shopping will be done. I thought it would be nice to include some gift recommendations from my literary friends. I don't know if it will sell any copies or not, but it is my attempt to "hand-sell" some books via cyber technology. Thanks so much for touting my book! 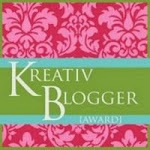 I am only now coming to your blog after deliberately avoiding it for months because... I just last night finished The Deathly Hallows! I knew looking at your site would be a spoiler. I am loving your posts on Paris and can't wait to see what you had to say about HP. I'm interested to know what you thought of the last installment as well as the series as a whole. I tried this holiday to support as many of my author friends by following my own recommendations list and The Witch's Trinity was one of the gifts I gave. I was glad to see a stack of them face out in the new releases in fiction shelf in my local B&N. I hope you and your family had a wonderful holiday. The first with your little babe. I remember how precious the first Christmas was with our son. Having him there with us was better than any gift.